Fabry's disease is a rare X linked recessive inherited lysosomal storage disorder. In young adult stroke Fabry's is the cause of stroke in about 5% of males and 3% of females labelled as 'cryptogenic stroke' [Fellgiebel A et al 2006]. Both males and females should be screened for this XLR inherited disease when investigating young adult cryptogenic stroke. There are several mutations that all lead to reduced alpha galactosidase activity in cell lysosomes. This leads to a build up of globotriaosylceramide (GL3) in various organs [Toyooka K 2011]. Lipid deposits occur in vascular endothelial and smooth muscle cells leading to vascular dysfunction with ischaemia though the exact mechanism is unknown. Peripheral neuropathy: Patients complain of neuropathic pain with burning pains in the limbs "acroparaesthesia" which starts in adolescence or before aggravated by exercise. Eyes: corneal dystrophy. Corneal verticillata detectable by slit lamp examination. Cardiac: LV hypertrophy and conduction abnormalities. Hypertrophic cardiomyopathy may be seen. Renal: Progressive renal disease and eventual chronic kidney disease. CNS: small vessel stroke disease is significant, large vessels strokes are commoner and may more reflect co-existing cardiac disease and cardioembolism or ongoing hypertension. Approximately 13% of patients experience TIA or stroke like symptoms usually in males under the age of 45 and it is more common in those with valvular heart disease, LVH, arrhythmias or coexisting hypertension. Despite the fact that it is XLR female heterozygotes may be affected with an increased risk of ischaemic stroke and TIA despite the fact that the alpha-galactosidase may be within the normal range. This is due to random X-inactivation. ECG may show non specific changes and conduction abnormalities. U&E: elevated creatinine suggesting progressive renal failure. 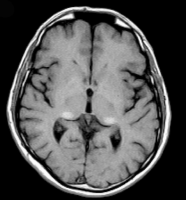 MRI studies show severe progressive white matter lesions (WMLs). In addition to this hyperintensities in the lateral pulvinar on T1 weighted scans are seen. Clinical strokes and radiological lesions are commoner in the posterior circulation. Interestingly WMLS are seen in both males and female 'carriers'. Angiography: There maybe dolichoectasia of basilar and vertebral arteries (dilation and tortuosity) on angiography. Increased basilar artery diameter has been shown to be superior for separating patients with Fabry disease from controls [Fellgiebel A 2009]. Reduced Alpha Galactosidase A activity may be measured in plasma, serum, and leukocytes. DNA analysis may be performed. Enzyme replacement treatment (ERT) with recombinant a-galactosidase A (alpha-Gal A) is available and should be considered for eligible individuals. It is useful for renal and cardiac disease and neuropathic pain and quality of life issues. Stroke related benefits however have not been shown. The effect on mortality is not known. Standard contemporary stroke therapy is typically given with anti-platelets and management of general vascular risk factors. Management of neuropathic pain is with ERT and usual therapies. Ongoing management of any progressive renal disease.